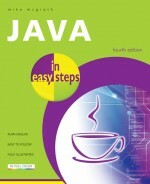 Java in easy steps instructs you how to easily create your own exciting Java programs. Now, updated for Java 7, it contains separate chapters on the major features of the Java language. Complete example programs with colorized code illustrate each important aspect of Java programming -all in easy steps. Now, in its fourth edition Java in easy steps begins by explaining how to download and install the free Java Development Kit (JDK) so that you can quickly begin to create your own executable programs by copying the examples. This book assumes no previous knowledge of any programming language so it's ideal for the newcomer to computer programming. Each chapter builds your knowledge of Java. By the end of this book you will have gained a sound understanding of the Java language and be able to write your own Java programs and compile them into executable files that can be run on any Java-enabled computer. "I did 'computer science' in the old days - pre object orientated design. I have spent the last ten years, on and off, buying various books and trying to get to grips with classes, objects, overloading and inheritance. This book did it for me. I read it, cover to cover, inside a week. I'll avoid the hyperbole. It is excellent. 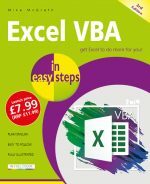 It does what it says: ' ... in easy steps'." Learn Java basics for free!